Born in Moscow in a noble family, the poet spent his youth in Tarakhany, his grandmother's estate in the province of Penza. In 1828, Lermontov was sent to Moscow University's boarding school for young gentlemen and in 1830 he entered the university itself. 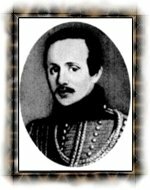 Shortly afterwards, as a result of a clash with the reactionary teaching staff, Lermontov was obliged to leave the university and entered the St. Petersburg School of Ensigns of the Guards and the Cavalry Cadets. He completed his studies there in 1834 and was given a comission in the Hussar Regiment of the Imperial Guard. In 1837 the poet exiled to the Caucasus for having written his poem on Pushkin's death, which he blamed on the ruling circles of Russia under Nicolas I. The works he wrote after his return from exile together with his independent behaviour earned the dislike and enmity of the court and he was exiled to Caucasus a second time. As a result of intrigues by officers of the gendarmerrie, or secret police, he was provoked into a personal quarrel with an old schoolfellow, Major Martynov, and this led to the duel on 15 July 1841 in which the poet was killed. He was not quite twenty-seven.